I am a member of national MGMA. Does this mean I am a member of Massachusetts/Rhode Island MGMA? No. Membership is not reciprocal between the national MGMA-ACMPE and state organizations. Log into the web site and update your profile. Our membership year is a rolling 12-months. 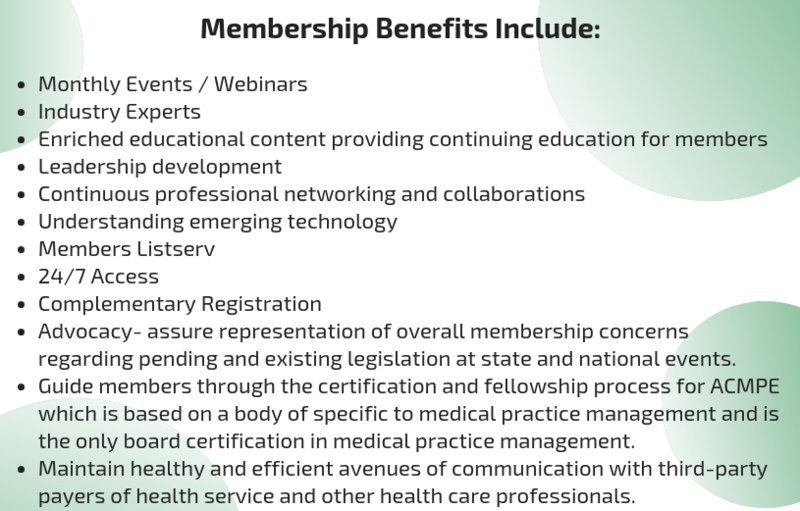 Membership in Massachusetts/Rhode Island MGMA is on a rolling 12-month basis. You can enroll as a Business Resource Member, Individual, Insurance Representative, or Student/Faculty member. Massachusetts/Rhode Island MGMA also offers Group Membership. To learn how your organization can join as a group at a discounted rate, click here. Contact us for more details regarding group or organizational membership at 844-243-8282 or info@mmgma.com. If you are an Insurance Representative interested in membership, please contact a member of the Massachusetts/Rhode Island MGMA Team at 844-243-8282 or info@mmgma.com. Membership Renewal: If you are a member of MA/RI MGMA, please log into your account and click Renew Membership. Do NOT use this page to renew. An Individual Member is a person who works in the management and/or operations of a Medical Group Practice. A Business Resource Member is an individual who is engaged by an organization that offers goods and/or services to a medical practice. A Student/Faculty Member is a full-time student or full-time faculty member enrolled or teaching in a health care related Undergraduate or Masters program at an accredited college or university in the Commonwealth of Massachusetts or the State of Rhode Island.